Our article Amazon.com 700,000 New Sellers in a Year, Less Than 10% Are Selling Today has become one of the most read articles we’ve ever written so we came back to research that topic more. This time we looked at how many of the top Amazon sellers (read more on how we rank Amazon sellers) have joined in the past 365 days. It is an interesting number to look at because as we found, it shows that it takes a while to become a top seller. There are two key findings from this research. First, sellers are able to build a lasting business. Amazon fees (especially FBA fees) are constantly changing, counterfeit products is an often headache, building long lasting private label brands is yet to be solved, etc. Yet plenty of sellers are selling for years. Second, becoming a top seller takes time. This is most likely impacted by access to capital or credit lines, as for efficient retailers that is the only growth limiting factor. Few sellers are able to do what GNC did, by launching on Amazon having already established a business. 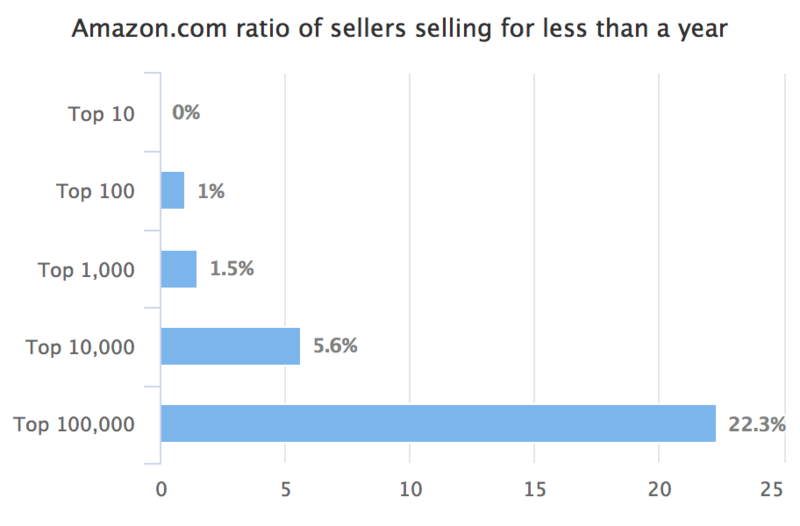 Most start small on Amazon and grow over the years. Thanks to their market dominance Amazon doesn’t have to do marketing to attract more sellers, there is plenty of interest already. But by establishing a stable base of top sellers, it has made sure the catalog stays in stock. As we have pointed out many times thousands of sellers join Amazon marketplace every day, yet most of it is noise. Majority of marketplace sales are captured by old sellers. In the last 12 months, we detected close to 700,000 new sellers join Amazon.com. Out of all the new sellers in a year, less than 30 percent ever get a sale, and less than 10 percent are still selling today. The takeaway from the above is that very few sellers continue selling for years, but those who do can become top sellers. It’s simply not possible to become a top seller quickly.